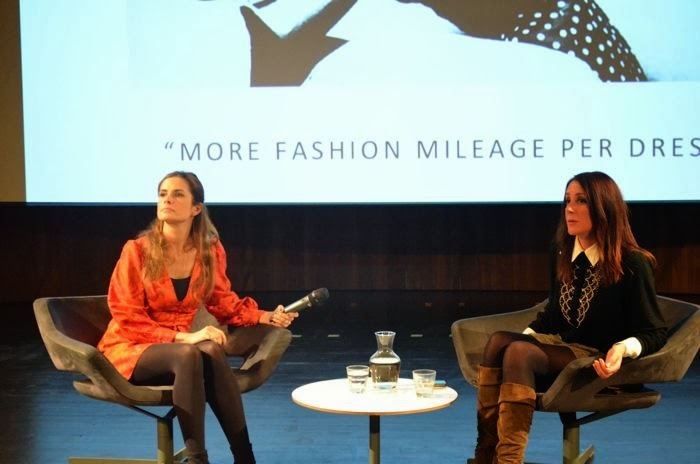 The Victoria and Albert Museum hosted another fantastic lecture the other night featuring Colin Firth's wife, Livia Firth, who is the founder of the Green Carpet Challenge, which is an organization that works to create sustainable fashion that is made ethically. Livia Firth said that she was not into fashion until her husband was nominated for several awards for his role in the movie, The Single Man. She realized that she would be featured on the red carpet a great deal and wanted her evening gowns to have more of purpose than just a regular red carpet dress. One focus of the Green Carpet Challenge is to avoid materials that are sourced from sweatshops. Firth pointed out that while it may seem democratic for a consumer to purchase a $2 t-shirt, it is not democratic for the person who made the shirt. Above, Meryl Streep is wearing a Lanvin dress made out of fabric that the Green Carpet Challenge considers sustainable. The Great Carpet Challenge also focuses on production processes that are environmentally sustainable. Some fashion designers have made clothing made out of recycled plastic bottles, such as the dress Viola Davis is wearing above. Livia Firth is doing incredible work and is making an impressive impact on the fashion world. Industry heavyweights such as Stella McCartney, Alice Temperley and Anna Wintour have all supported the Green Carpet Challenge in various ways. But some questions were left unanswered. What about poverty-stricken people who can afford only a $2 t-shirt? Additionally, while it is commendable to stop purchasing clothing made in sweatshops, how do we address the underlying issues creating poverty for those people who do work in the sweatshops? well that pretty much rocks. And your questions at the end are spot on - I hope Lauren finds this because this is right up her alley. Thanks, lady. It was a really interesting lecture and definitely makes me think about all the things I purchase. Hugs to you! Comment moderation has been enabled. All comments must be approved by the blog author.